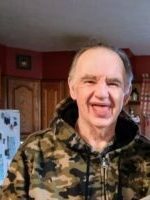 John passed away Thursday, January 31, 2019 at Morrell Family Home in Martin. He was born June 2, 1949 in Boyne City, Michigan, the son of William and Flora (Shedd) Stinson. As a young man John enjoyed playing bass in a band with his brother. The last few years he has spent time in area adult foster care homes and enjoyed going out to eat. Surviving are his children, Shawn and John Jr.; siblings, Guy (Karen) Stinson, Harold (Bonnie) Stinson, Hilda Burchett, Nancy (Hank) TerLaan and George Stinson. He was preceded in death by his parents; brothers, Bill and Ed; sisters, Lillian and Doris and by his brother-in-law, Raymond Burchett. John’s siblings would like to thank the adult foster care homes that have provided outstanding care for John over the years. Burial of ashes will take place at Olive Township Cemetery at a later time. Contributions in memory of John may be made to the Salvation Army. Offer Condolence for the family of John H. Stinson Sr.
Posted by Winkel Funeral Home on January 31, 2019 2 Comments on John H. Stinson Sr. So sorry for the loss of your brother. We are praying for the family. John was such a sweet man. He made working at Morrell’s even better. I would always get a good morning hun and a big hug. He would tell me stories about his family, especially his kids. We would always just sit and talk and do his favorite puzzles together. Also on craft day he was one of the first volunteers. He is truly missed at the house!